In Q3 2014, IT positions made up 11% of all job openings, and IT certifications can help get you in the door. An overwhelming majority of IT professionals and their hiring managers agree on the value of certifications. 93% of hiring managers believe certifications are beneficial. IT certifications offer: a competitive edge in a cut-throat job market, heightened career advancement opportunities, and increased value to employers and their organizations. How do your recruiting requirements match up with industry standards? Many businesses are struggling with IT hiring due to large skill gaps in the workforce. More than 600,000 IT jobs remained open in Q3 2014 due to the lack of skills of the applicants. From the US Bureau of Labor Statistics, thanks to the high demand for technical skill sets, IT professionals experience unemployment at significantly lower rates. In September 2014, the overall unemployment rate was 5.9% and the unemployment rate in the IT sector was 2.8%. The Bureau of Labor Statistics estimates fields in technology will experience faster than average growth (some over 20%) between 2012 and 2022. More than 700,000 new IT jobs will be added over the same 10-year period 2012 to 2022. IT encompasses a wide range of fields, from programming to security and management. An overwhelming majority of IT professionals and their hiring managers agree on the value of certifications. 70% of IT professionals believe CompTIA certifications are valuable or very valuable. 93% of hiring managers believe certifications are beneficial. A large number of businesses across countries expect the value of IT certifications to increase over the next two years including including 87% of businesses in Brazil. CompTIA Certifications are taken by IT professionals who are looking for career advancement. 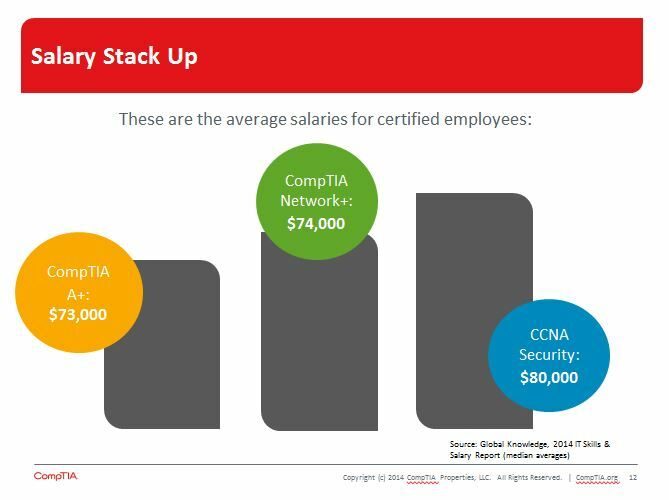 Based upon a survey done in 2014, salaries for IT personnel with an A+ Certification average $73,000, for those with a Network+ Certification, $74,000, and those with a CCNA: Security Certification earn $80,000. A strong majority of IT professionals have found benefit from obtaining certifications: 76% report having more job satisfaction, 16% received a raise, and 32% were rewarded in other ways for obtaining their certifications. Organizations believe employees with IT certifications add value to their work; 58% believe staff holding IT certifications are more valuable. 64% of US hiring managers believe that certifications are quite valuable. Certifications address the skills gap by confirming skills and reducing turnover. 84% of newly certified workers remain with their current employer. 73% of businesses believe it is important to test knowledge after training. Over half of surveyed companies said certified employees save their business time and money on the hiring process, and nearly half said certified employees learn faster on the job.